The general area of condensed matter physics focuses on understanding the ensemble properties of matter from small clusters of atoms and molecules to macroscopic solids and liquids in their myriad forms and certain aspects of biological physics. The creation and study of new materials is a central goal of this field. Condensed matter experiments push the limits of spatial, temporal, and energy resolution. New technologies can also emerge as a natural consequence of such studies and is a major driving force behind condensed matter research. Collaborations are facilitated by the Center for Condensed Matter Sciences (CCMS). 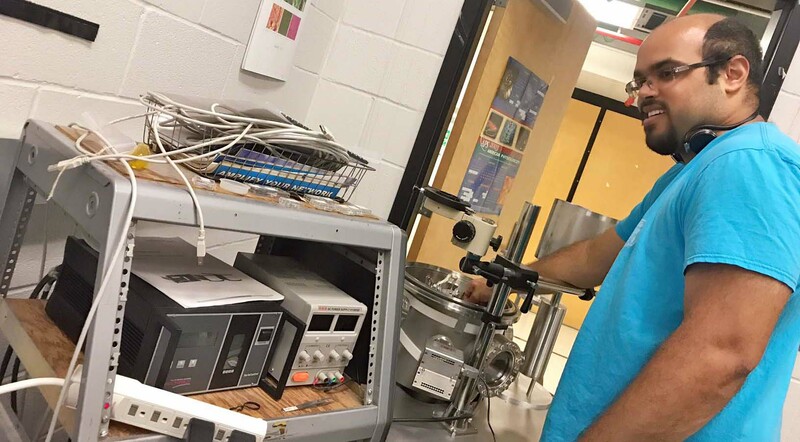 Strong interdisciplinary collaborations exist with groups working in chemistry, materials science, medicine, and molecular biology with support from University-wide facilities such as the Major Analytical Instrumentation Center (MAIC) and the Nanoscale Research Facility (NRF), and at numerous national and international universities and research institutions, including the National High Magnetic Field Laboratory, Oak Ridge National Laboratory, Argonne National Laboratory, Los Alamos National Laboratory, and Brookhaven National Laboratory.